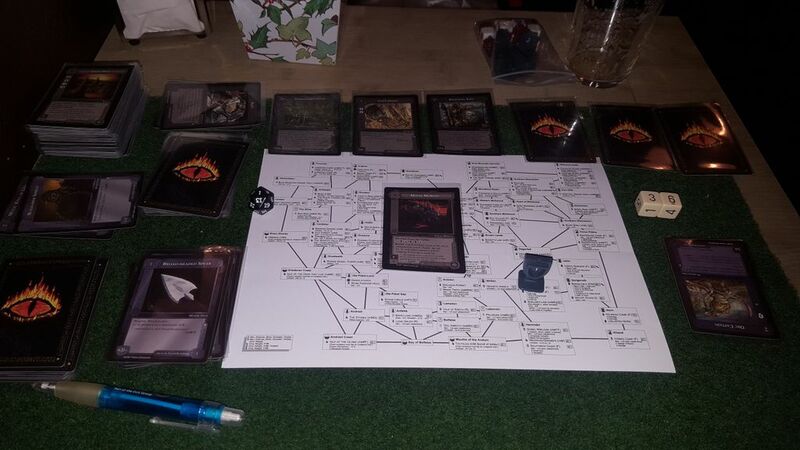 So with the new year I decided to try and grok the Lidless Eye standalone/expansion for Middle-Earth. I’ve had a complete set for nearly as long as I’ve been on BGG (bought long before they became pricey) but always have found the rule differences and concept of playing the Nazgûl a bit hard to wrap my head round. Well, After a successful read of the Hobbit I’m currently reading Lord of the Rings to my son (he’s only two so it’s mostly for me really) and I am getting much more out of the historical and descriptive sections so that coupled with my understanding from my many plays of ‘vanilla’ Middle-Earth (colloquially known as ‘The Wizards’) last year I thought this was as good a time as any. I did consider starting with the excellent Arda rules (as I did with Middle-Earth) as it’s a good way to start as there’s no deck-construction. However, whilst it was something I used to hate, after playing a couple of Darkyeoman’s excellent solo scenarios last year I am growing to enjoy the Deck Construction as I now view it as part of the game, the prologue if you will. 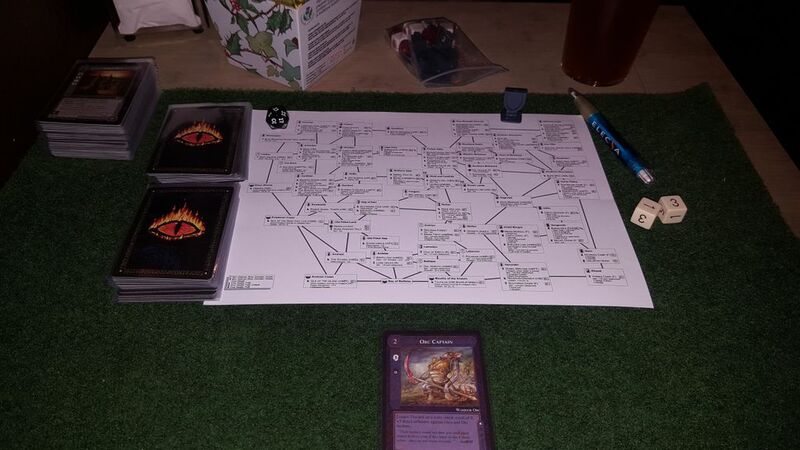 So I dug out an old scenario from the Lidless Eye Companion called “Sauron’s Revenge” and set about choosing cards. In it you create both the Hazard and Resource decks with twenty five cards to aid you in what is effectively a big punch up as the Nazgûl take on all comers, playing a ring direct from your hand upon defeating them trying to maximise Victory Points. So, given the difficulty my hideously unequipped brain assigned the task I didn’t really put much thought in and I just threw in a handful of each of the ‘target’ races in the hazards along with another scattering of cards to make things harder for me. Yep, I thought it was going to be that easy. Resource wise I put in loads of rings as without them when you defeat hazards you get bugger all beyond a mild sense of accomplishment, as well as a scant few Major Items to ‘beef up’ my company. I then chose the Witch-King and another random Nazgûl along with 5 non-unique (but different) Orcs as my characters as I thought I’d be able to play them anywhere (Their home site is any Dark-Hold which Imlad Morgul is full of). I chose to start with only one Orc in Minas Morgul and gave him a Minor Item in the form of a Black-Hide Shield. Armed with my highly functional but not as pretty map of Middle-Earth I set off to reclaim rings in the name of my dark lord, Sauron. My Orc Captain headed from Minas Morgul to the Dead Marshes with the intent of defeating any hazards (in my mind there was no doubt) and then playing a Major Item I had in my hand. This scenario has a really simple but thematic approach to Hazards where they stay face up if not encountered meaning you can ‘track them down’ by making sure their site path is matched on a future turn. So with these ‘rumours’ of Thranduil’s Folk, Cave-Drake (mislabelled I believe as a Dragon so carrying a ring) and Beorning Toll I arrived at Minas Morgul to face the Men Hazard, “Sellswords Between Charters” and was suddenly and sharply reminded of how brutal combat in this game is without any cards or additional characters to mitigate a bad roll. Yep, I was wounded. I then nearly failed my Body Check and my Orc Captain was only saved by his Black-Hide Shield. 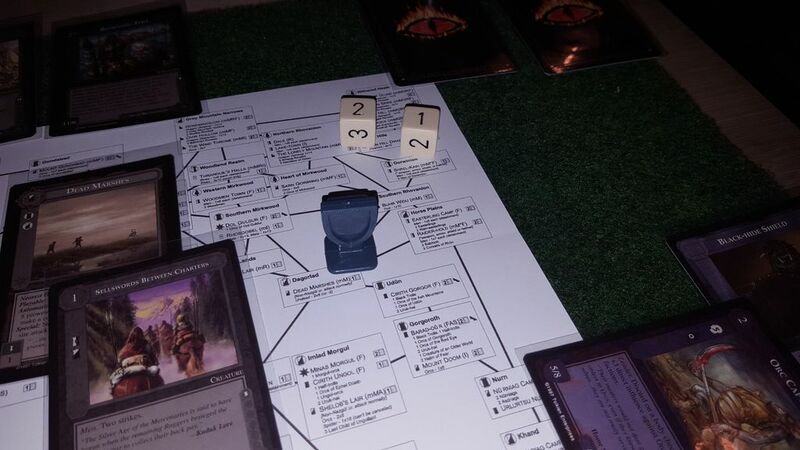 I decided to limp home to Minas Morgul to heal knowing it would be unlikely any Hazard could be played on my Site Path but one of the very small number of non-straight up fight encounter cards I put in to make things harder showed up and did just that. My Orc Captain’s Black-Hide Shield was destroyed by rats. I did then make it to Minas Morgul effectively back to square one but hobbled and having used up three of my twenty-five resource cards (this scenario ends when you’ve been through the deck once and reach zero). My first foray into Middle-Earth: The Lidless Eye then drew to an early close as I had to head back home but a great time was had. It’s a very different beast to METW, not just because of this scenario but also the splendid minor rules changes I’ve read about but have yet to experience fully including; Leaders, Nazgûl movement, Detainment, Stalwart Orcs, useful Allies, Character Manifestations, Orc Scouts, Overt/Covert companies and Trophies. Not to mention the host of rules tweaks when playing Wizard Companies vs Nazgûl ones. A great game and worth playing if you like Middle-Earth and you can get hold of a copy. Thanks for this Craig. It's really nice seeing people play this incredible and highly underrated game. I too have had trouble getting used to some of the rules differences between MELE & METW. The Nazgûl movement is very tricky in trying to coordinate your company's movement with it's limited mobility. Also, I found that the hazards and the conditions in facing them are much harder then the base game version. Playing this game solitaire, wether with the MELE or METW sets, is a very satisfying experience. Not as good as when playing a live opponent, but the game is a ton of fun to play solo none the less. Please post any future forays you play within this great game. The level of immersion into Tolkien's world is astounding with the lore and other quotes from the novels abounding in the flavour text on the cards. Apart from Magic: The Gathering, IMHO, no other card game ever created can stand with this gem of a game! Great post Craig! I really like your writing style and the concise write up of your session. I too have been enjoying Darkyoeman's scenarios lately. I have not played with my Lidless Eye cards much but what you shared here has got me interested in going after it like you did. Looks like fun - thanks! Great session report. I had never gotten a chance to play Lidless Eye and this wets my appetite! ever created can stand with this gem of a game! That ME:CCG stands on the pinnacle of L/CCG gaming history is not up for debate. But Magic does not crack the top 5. Garfield's 2nd and 3rd designs surpass his first - Netrunner (old or new) comes in right behind ME:CCG, followed closely by Jyhad/V:TES (the best of the 3+ player games). I respect your opinion and see the other games you list and feel that they are, as you do, exceptional good games indeed, but sorry Henry, in my & thousands upon thousands of other peoples opinion, Magic is the best game ever invented. Yes it has its faults, but it shines in so many ways and can be played in so many different formats, it boggles the mind. Limited Magic, especially draft, is one of the most skill intensive and competitive fields of play in any game that has ever existed. I don't go by any of the ratings here at BGG or anywhere else of any game I like or play, what matters to me is the feeling I get, the excitement, the challenge and the looking forward to my next game I play that counts. For me,NOTHING comes even remotely close to playing high level Limited Magic. I could draft all day, every day if I could! I love many games, or I wouldn't be a member here, but Magic is head and shoulders above any other competitive game I've ever played and the one I have the most fun playing and think about my games after I play about, regardless of what format I'm playing it in. The mere fact that I have been playing this game for nearly 25 years and STILL feel this way speaks volumes on just how incredible this game is! So, I respectively disagree with you as strongly as I can. Magic is well... Magic! I like this too about The Lidless Eye: rather than just swapping Wizards for Ringwraiths, the designers worked hard to make the rules for Ringwraiths fit thematically. Unfortunately, for some reason, I have a hard time playing with Ringwraiths. Not because of the added complexity of the rules, but because it feels strange to play for the destruction of what J.R.R. Tolkien built in his tales. The world of Middle Earth is too strongly tied to Tolkien's ethical (and even spiritual) vision in my mind. I have worked on developing some solo scenarios with Minion decks, but they haven't gotten very far for the above reason. I'm glad to see you are enjoying it, though, and might have another look at the scenarios from The Lidless Eye book. Any chance you could share details of the scenario itself? Sauron is very angry. His rings, the rings he worked so hard and long for, are in the possession of other people. You have been commanded to seek out the impudent thieves and retrieve the rightful property of the Dark Lord. He also wants the bodies of the thieves, to hang in his realm as warning to all who would steal from him. This is a solitaire scenario. You should build a hazard deck with 25 hazards, mostly creatures of the appropriate types (see below). You should also build a resource deck with 25 resources, up to 5 characters and up to 2 Ringwraiths. During the game there will be a hazard hand and a resource hand, each consisting of five cards. At the start of the game draw five cards into each hand, but leave the hazard hand face down on the table. Any time cards are drawn for the hazard hand they should be placed face down to the right of the hazard hand. When drawing cards based on company movement draw cards for the resource hand as normal. Draw cards for the hazard hand as if it was being played by your opponent, but place them face down at the right end of the hazard hand. Start at the left end of the hazard hand and look at each card in order from left to right, flipping cards over as necessary. If the card can be played on the company then play it, otherwise leave it in order on the table. Play hazards in the way that is worst for the company. Continue this until all cards have been check[ed] for playability or the hazard limit has been reached for that company. When any Man, Orc, Dunadan, Elf, Undead, or Dragon attack is defeated you may immediately play a ring item you have in your hand. What ring items can be played depends on the creature type, check the table below. It must be played on a character that defeated a strike from that attack, but the character does not need to tap to play the ring. Anytime you defeat a creature and play a ring item, place the creature in your MP pile (even if the creature does not have an * next to its MP value). If you defeat a creature but do not play a ring item, remove the creature from the game but do not place the creature in your MP pile (even if the creature does have an * next to its MP value). If at the end of the movement/hazard phase you must discard cards from the hazard hand, discard cards from the left side going right until you are down to five cards. If all of the cards in the hazard hand are face up and a company moved this turn and no hazard cards were played this turn, discard the entire haard hand and replace it with five face down cards. The Audience of Sauron is called automatically at the end of the turn after the resource deck is exhausted. You only get MPs for ring items and creatures in your MP pile. The goal of the game is to get as many MPs as possible. 0 - 10 MPs Sauron is not happy. Have fun in the Dark Lord's torture chambers. 11 - 15 MPs Sauron demotes you to guarding the breeding pits. 16 - 20 MPs Sauron mumbles something about incompetence and dismisses you. 20 [?] - 24 MPs Sauron is pleased and holds a banquet in your honor. 25 MPs or more Sauron places you in charge of the armies of Mordor. Note: If you have a limited number of cards, add 5 MPs to your total to determine your level of victory. Note: This scenario is similar to its hero counterpart, Heirlooms of the Past. Oh, that is sad indeed!